It has been almost five months since the start of the most publicised trail in South African history. Since Valentine’s Day last year when Oscar Pistorius killed his then-girlfriend Reeva Steenkamp, headlines across the world have covered the trial which has captured the imaginations of millions. South Africans have been fanatically following the developments and commenting on the possible outcomes of the trial. But what effect does this obsession with the Pistorius case have on victims of violence, and on the South African psyche? Violent crime has permeated South African culture. According to DefenceWeb.co.za, a site dedicated to reporting on defence-related news, there are 45 murders daily in the country. For the most part these cases go under the radar, but the Oscar Pistorius trial has sparked national interest and highlighted the issue of violence. According to an analysis done by hashtag.org, the hashtag #oscarpistorius reached an astounding 40 tweets per hour at its peak. Usually, in these many cases of murder and violent crime, the families of the victims and the families of the people accused of these crimes are left to deal with their emotions in private. But in the Pistorius case, the constant media scrutiny might be causing additional pain to these families. There is a sense of national mourning for the death of Reeva Steenkamp, and many also seem to mourn for the tarnished reputation of a phenomenal athlete. Ultimately, however, the heightened interest into this case could be seen as intrusive into the much greater losses which were suffered by the families. The interest seems to point to a fascination with fallen idols and with celebrity culture, and to a concern with only the horrors of those who are rich and famous mostly to the exclusion of others. This focus on one case of murder seems to marginalise the pain suffered by others. By oversympathising with the Steenkamp family or even with Oscar himself, it seems that so many other victims of violent crimes are ignored. As a nation, we must be careful of overidentifying with one person's pain and potentially marginalising the pain of others. When we solely focus on these celebrity cases, it diminishes the greater concerns of gender-based violence and violent crime in our country. 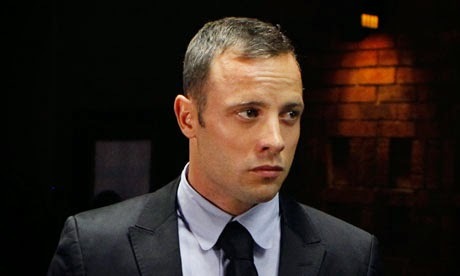 Through our fascination with the pain in this case, both the pain of the Steenkamps and the pain of the many people who vocally and vehemently support Oscar, it seems to create a national voice of mourning which is displayed in the larger-than-life trial. Whether we demonised or absolve Pistorius in our tweets, comments or conversations, we are losing focus of the greater issues pointed to by this trial, and instead focussing on the fleeting, unfolding drama.